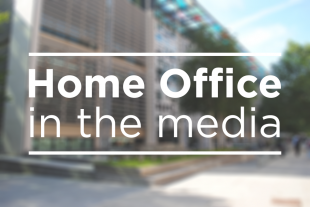 Today’s Home Office stories include the new head of Interpol, a report into how victims of terrorism are treated and continuing coverage of a violent attack against police officers in South London. There is widespread reporting on broadcast, online and in the papers on the Interpol election of its new president. Print coverage focused on claims Britain and America led an 11th hour attempt to stop Alexander Prokopchuk from becoming the international police body’s head. Mr Prokopchuk, a veteran of the Russian interior ministry, was the favourite in the election. There was widespread criticism that it was inappropriate for a Russian to lead the organisation following the Salisbury attack. This morning though broadcast media reported that the South Korean, Kim Yong Jang, won on the third round of voting who Britain had pledged to vote for. We congratulate Kim Jong Yang on his appointment as President of INTERPOL. INTERPOL is a key global partner in international police co-operation and we will continue to work with our international partners to ensure it supports our security and prosperity. There is widespread reporting on broadcast and in the newspapers on a report into the support given to victims of terrorism. Victims are waiting more than a year for NHS mental health treatment and some adults and children become so desperate they pay for their own treatment, the Survivors Against Terror report states. More than three quarters of the 271 survivors surveyed felt let down and said mental health services needed improving, the Telegraph reports. Those affected by terrorist attacks rightly expect effective, comprehensive assistance. The report found that in many areas survivors rate the support their receive highly, but there is clearly more to do. Following the attack in Manchester, we provided funding for specialist mental health support in the city and the Government’s Victims of Terrorism Unit will continue to ensure the support for those affected by attacks both at home and abroad is swift and coordinated. We will continue to learn from the experiences of victims and look forward to working with Survivors Against Terror to inform our work. There is further coverage of the violent attack on police officers in South London. The reporting is largely focused on calls by Lancashire Chief Constable Andy Rhodes for the public to ‘help and not hinder’ frontline officers if they are inclined to support them. Mr Rhodes said although there are ways for the public to help officers they should not think there is a ‘green light for have-a-go heroes’, the Mail reports. This footage is appalling and sickening. Being attacked should never be part of the job for our courageous emergency services workers, who put themselves in harm’s way to protect us. That’s why we supported the Assaults on Emergency Workers Act which came into effect last week. The Act means that judges must consider tougher sentences for assaults on emergency workers, including police officers and staff. BBC News, the Independent, Telegraph and Mail all report that half of asylum accommodation in the UK is not fit for purpose, according to a report by the Independent Chief Inspector of Borders and Immigration (ICIBI). The report revealed that in the 22 months to January 31 this year, just 24 percent of 8,313 properties inspected complied with standards, with frequent references to damp, dirt and vermin. Whilst this report covers a small sample of the 12,000 properties for asylum seekers, the Government is committed to improving the service in the areas the Inspector has highlighted. Our comprehensive action plan will support customers in raising issues with their accommodation and ensure vulnerable people receive a more tailored service. In addition, we have restructured our routine inspections so that our approach to managing the contracts and accommodation standards is more consistent nationally.